For Offer by the Amazon.com seller, Steven N.
UNCOATED NON-NANO ZINC - This powder contains uncoated non-nano zinc particles that won't penetrate the bloodstream. It is safe to use for cosmetic purposes compared to other products. You can use this for DIY sunscreen, rash lotion, and more. 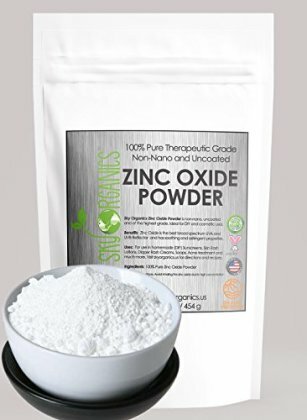 PURE WITH NO ADDITIVES - Sky Organics Zinc Oxide Powder is certified 100% pure, therapeutic grade. It won't cause irritation because it doesn't contain nanoparticles permeate to the skin. What you get is simply an all-natural powder that has optimum efficacy. PROTECTS THE SKIN -This powder is perfect when added in homemade sunscreens thanks to zinc oxide's UVA and UVB protection. It also has skin soothing and astringent properties, which makes it an ideal ingredient for skin rash lotions and creams. FOR DIY PURPOSES - This zinc oxide can be used for various DIY products. Add and mix this versatile powder for homemade sunscreens, lotions, creams, soaps, facial scrubs, and more. It's a great product for creating beauty, bath, and skin care items. CRUELTY-FREE - This all-natural powder is eco-friendly and cruelty-free. It wasn't tested on animals, so you can rest assured that no living beings were harmed during its production.